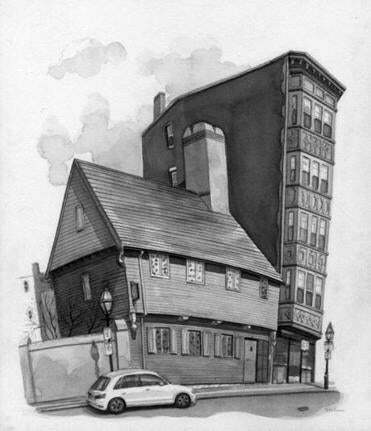 Fred Lynch drew the Paul Revere House, where the silversmith lived at the time of his famed 1775 ride. Fred Lynch leaned back on his portable stool in front of the Old North Church, surveying the replica drawn in his sketchbook. The crowds wound around his chosen spot on the sidewalk, pedestrians glancing with confusion at the man who had set up camp for over two hours in front of the historical building in Boston’s North End. The light had changed since he first began drawing, and the shadows fell completely differently. Lynch glanced up again at the looming steeple and decided the visit had been long enough for this illustration — he could add the small details on the windows at home. Although Lynch chooses his subjects based on what strikes inspiration, the decision to illustrate the location of Paul Revere’s famous lantern signal — “One if by land, two if by sea” — is no fluke. For almost five years, the artist and professor of illustration at Rhode Island School of Design followed the path of Revere’s midnight ride in April 1775 and drew what remains there today. Nineteen selected pieces from the collection, which Lynch named “Paul Revere’s Ride Revisited,” are on exhibit at the Scottish Rite Masonic Museum & Library in Lexington until March 7, 2020. Each piece is accompanied by a description, including anecdotes from Lynch. In fact, Lynch is usually drawn toward the less traditionally picturesque scenes — he doesn’t want to replay an old song everyone has already heard. One of his favorite works in the collection is an illustration of the spot in Somerville where Revere changed course after a run-in with British soldiers. Today, it is Royal Pizza & Subs. Royal Pizza & Subs sits near the spot in Somerville where Revere was almost captured by the British. On a recent visit to the museum, Lynch walked along the hallway where the illustrations hung. He pointed out details on certain pieces, causing the frames to sway back and forth for a moment before he steadied them with his hand. He spoke with the confidence of a longtime professor, occasionally cracking self-deprecating jokes. The drawings on the walls are not reprints, as are commonly seen in museums. They are the original pieces Lynch nearly completed in one sitting, first sketching them out in mechanical pencil and then brushing on the black ink. The papers are warped on the edges from water, adding a just-completed, yet historic, mood to the exhibit. Lynch said his goal as an illustrator is to tell a story with a single drawing. He rarely includes people in the Revere pieces because it distracts from the portrayals of the buildings. And, while he wants his depictions to be credible, he’s OK if the pieces don’t turn out perfect. That’s actually part of their charm. But why the story of Revere, and, more specifically, why his midnight ride? Each July, Lynch accompanies a group of students to Italy to teach illustration. 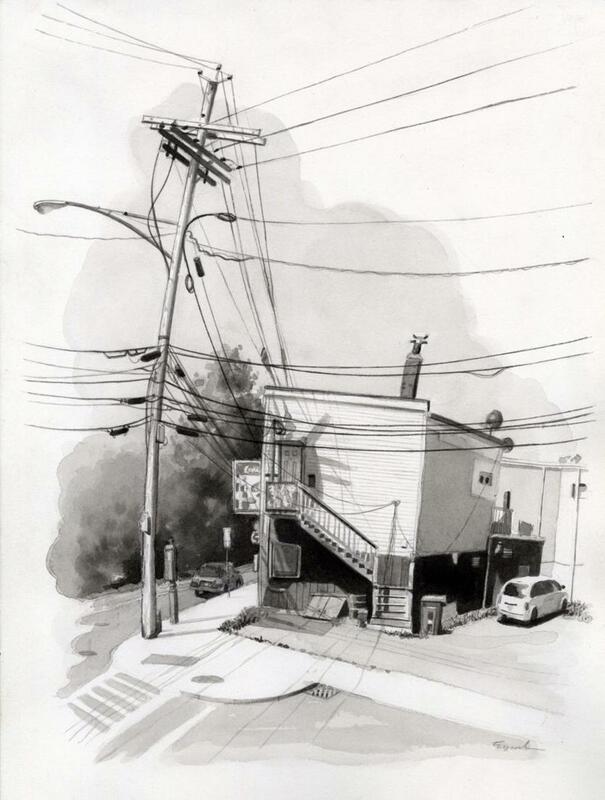 He spends his spare time roaming the streets and drawing the classical architecture that leaps out at every turn. Lynch noticed being abroad heightened his sensitivity to the world around him, but that it wore off about two hours after getting off the flight heading home. He strives to maintain the same fresh perspective back in Massachusetts. A Winchester resident, Lynch lives just 5 miles away from Revere’s route. On the evening of April 18, 1775, Revere was directed by Patriot leader Dr. Joseph Warren to ride to Lexington with news that British troops were on their way to arrest Samuel Adams and John Hancock. Revere — a silversmith, engraver, and express rider for the Patriot cause — rode from Charlestown through what is now Somerville, Medford, Arlington, and into Lexington, before his capture en route to Concord, the British troops’ ultimate destination. Lynch had always had a bit of a fascination with the past, as his father was a high school history teacher. So, Lynch decided he would search for inspiration along the same path Revere had ridden in 1775. He ended up with 35 illustrations of locations along the way. 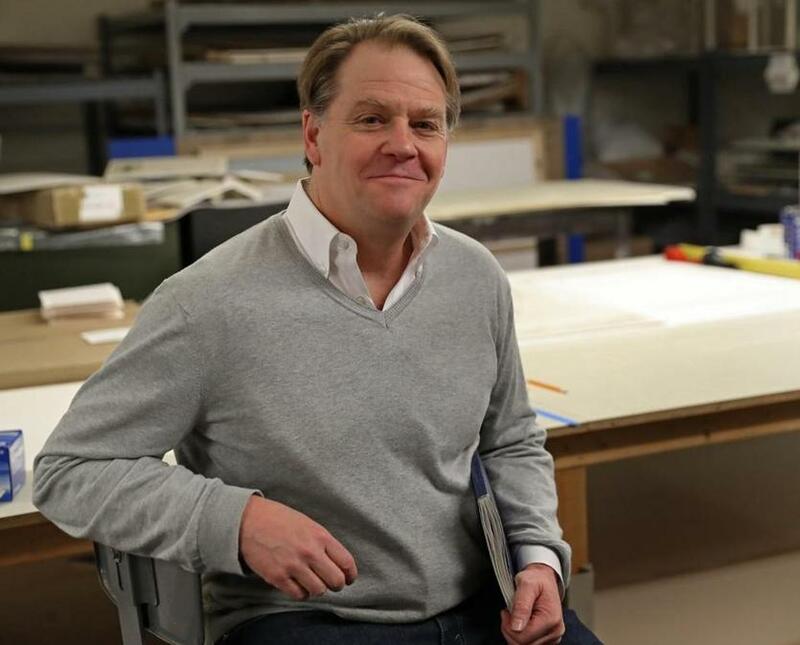 Lynch has since moved on from Revere, but continues creating “portraits” of architecture in a new project on the homes of his immigrant ancestors. “Paul Revere’s Ride Revisited” is on exhibit at the Scottish Rite Masonic Museum & Library, 33 Marrett Road, Lexington; 781-861-6559, srmml.org. Fred Lynch said he’s usually drawn toward the less traditionally picturesque scenes — he doesn’t want to replay an old song everyone has already heard.